The new iThemes.com is here. It’s been a long time coming (the previous design was 3 years old!) and we’re excited to share some of the new features that we hope will enhance your experience with the site. We’ve been intentional about the style and structure of the redesign, so every detail has a purpose and objective. iThemes has grown and changed dramatically in the years since we first launched, and we’ve badly needed a site that truly reflects who we are today by showcasing all of our products, services and content in a new way. You can check out this Q&A with Brad (our designer) and Ty (from our Creative Services division) about their approach to the redesign and their favorite parts of the new site. We’re hoping you’ll enjoy the new iThemes.com as much as we do, as we’ve finally combined the two-fold purpose of an easy-to-manage site for us on the backend, with a beautiful, efficient site for you, our guests and community, on the front-end. iThemes.com is no ordinary WordPress site. More than 250 pages, countless blog posts, integrations with our eCommerce and forum software – all sorts of complications that make switching over to a new theme a big deal. 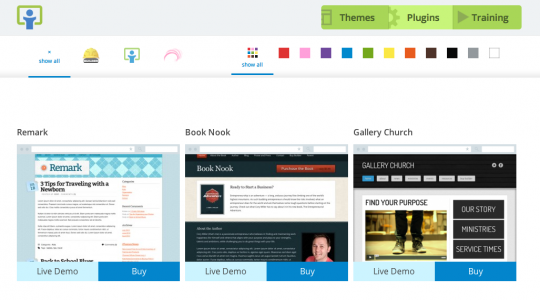 Because of this complexity, we avoided a major theme redesign for a long time. The longer we waited, the more the old franken-theme grew. But we’re finally happy to announce that our site is using the theme we built for ourselves in 2009 – Builder. We’ve been drooling over the features and flexibility of Builder as we’ve added to it and created themes for it. We realized how much easier things would be if we could only use Builder. And now we can take full advantage of it. We’ll be publishing a series of blog posts about how we’re using Builder in the new site and how we made it responsive, in the coming weeks. In March of 2010, we launched PluginBuddy as our plugin division to provide professional plugins with guaranteed support and updates. Since then, our plugin library has grown to include over 20 premium plugins and our best-selling plugin, BackupBuddy. We’re hoping PluginBuddy’s merge into the iThemes.com site will reduce confusion about our products and make it easier for visitors to find and access everything they need from one place without having to switch between separate domains. 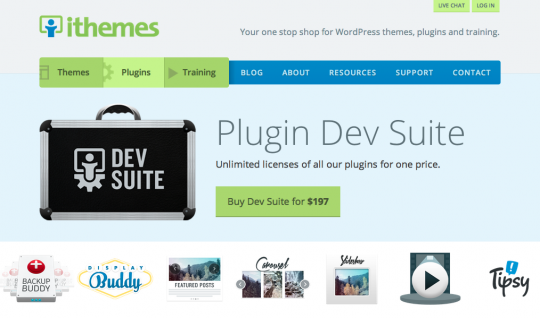 You can check out the all-new iThemes (formerly PluginBuddy) plugin store here. You’ll find completely redesigned sales pages for individual plugins, themes and combo packs with new feature overviews. Each of the DisplayBuddy plugins also feature new logos, feature overviews and FAQ sections, too. The new iThemes.com features a brand new way to view themes by type and color. Check out the iThemes Themes page to sort our themes according to color scheme and by classification as Builder child themes, Classic themes or Allure themes. We’re eager to hear your feedback, so share your favorite part of the new site below or tweet us @iThemes. We’re really looking forward to hearing from you. LOVE the new site! I like the lighter, brighter look and the theme sorting by color. Congratulations on a great new look! Thanks, Jan! Glad you like it. My favorite part so far is that my login here works across all three sections (iT, PB, and WD). Thanks for that. Hey Steve – your comment totally made us all laugh this morning. Thanks! And glad you like the new login – that’s one of our favorite new parts, too. Absolutely love the new look! Kudos to the team that made this happen. Looks great, guys! Love the nav and sticky bar. Hey Eric, thanks – glad you like it! Congrats on the new theme design! I too am in great need of a design update. Funny how that happens: our business grows, yet our main website becomes the cobbler’s childrens shoes. The last to get the attention it needs. I love that you are using builder! Products are always better when the founders use it themselves. Love everything you guys (and gals) do at iThemes! Thanks so much, Christina! We’re so glad the redesign is finally up and live – it’s true, it was such a big undertaking. But obviously well worth it! Again, thanks – I’ll make sure the team gets your kudos. Thanks all! Super thankful for the uber-talented team we have here and in particular Brad and Ty’s work on this redesign. VERY nice new design. Congrats! Would love to see this incorporated into some of the themes you sell. Looking great guys, does this mean Builder is now responsive? Hey Chris – we definitely made some extra customizations to accommodate for the responsive elements. But our devs are currently working on a solution for Builder that we’ll be previewing really soon. This was to be my question too – btw, love the new site! So any ideas when Builder will become “responsive”? – I have recently purchased other non iThemes themes in order to have some responsive themes to offer my clients and it left a bad taste in my mouth being a “builder” girl lol – would dearly love to have builder as a responsive theme..
Hey Sue, we totally understand. We want to have a responsive solution for Builder users as soon as possible, and we’re currently working on a few blog posts to explain our plans and where we are in the process. Thanks, that’s great Kristen, look forward to reading them.. Bringing the divisions together is a good idea. Thanks! We got that updated. Really nice – a real plus is I can show prospective clients about what can be done with Builder AND it looks really great plus loads very quickly on my iPhone!!! – Now I can show people I meet when out and about how great iThemes is from my phone. Hey Ronald – thanks. We really wanted to stretch the possibilities of Builder to showcase it in our redesign. I love the site guys. I’m not sure if you anticipated this, but the responsive, mobile-friendly aspects of the site are going to have your Builder user base drooling for a future update… or maybe a default or responsive child theme with responsive properties. Wow! Great looking website – simple clean and fresh. A huge improvement guys. Well done!! This was a long time in coming. This new design is sooo much cleaner, easier to navigate and just much more professional looking. Additionally, since it’s now using Builder, potential customers can get a first hand look at it in action. Congrats on a great looking new site!!! Although it appears responsive by dragging in the browser window in Safari on a Mac, when I look at the site on my iPhone it’s not viewing well in either portrait or landscape mode. I really hope that Builder will be upgraded soon to embrace responsive-ness “out of the box” as that is a must now in my client’s requests. The new site looks GREAT guys! Great job. And as always, thank you for developing such great products that make our lives as designers and developers so much easier! It really is a great design…but…how do I know if i want to buy your plugins if I can’t find a single live working demo of any of them on your new site? I don’t want to watch a video. I want/need to play with the plugin on multiple browsers and devices to see it function. Hey Zachary, we’re working on new plugin demos and we’ll get the sales pages updated. Thanks for the feedback. Looking forward to it…thanx for the reply! So, I gotta ask…When will it be available for a ChildTheme? We’ll probably keep this one for our own. I am also disappointed that you’ve removed the plugin demos. I need to show my clients the different options (Carousel, Slideshow, Rotating Images) in action so they can choose the one they like the best. Janet, we’re working to get all of the plugin demos updated and we’ll add them back to the plugin pages. Fantastic work, Guys. Love the redesign, especially the top “sticky” nav bar. Very Nice…I really like the Theme selection tool – too cool! Keep up the great work – you guys inspire!